I should have posted this short poem yesterday, after we received a burst of snow as a cruel April Fool’s joke. But I think it’s still apropos, since the cold and snow will remain with us for a bit longer. From my pew located on the left side of the church near the Fourth Station of the Cross—“Jesus Meets His Mother”—I look outside and see drops of rain splatter the mullioned window. Gray clouds hang low in the sky and the wind peels away leaves from some trees perched on a hill that slopes down to the parking lot. The rain reminds me of the tears Mary must have shed when she saw her son standing in front of her. She must have felt helpless knowing she could do nothing to save him. She could only weep as she watched Jesus walk by on his way to Golgotha. She had to let him pass. She could not intervene or obstruct the will of God. She knew Christ’s mission had to be fulfilled. But the hurt persisted. 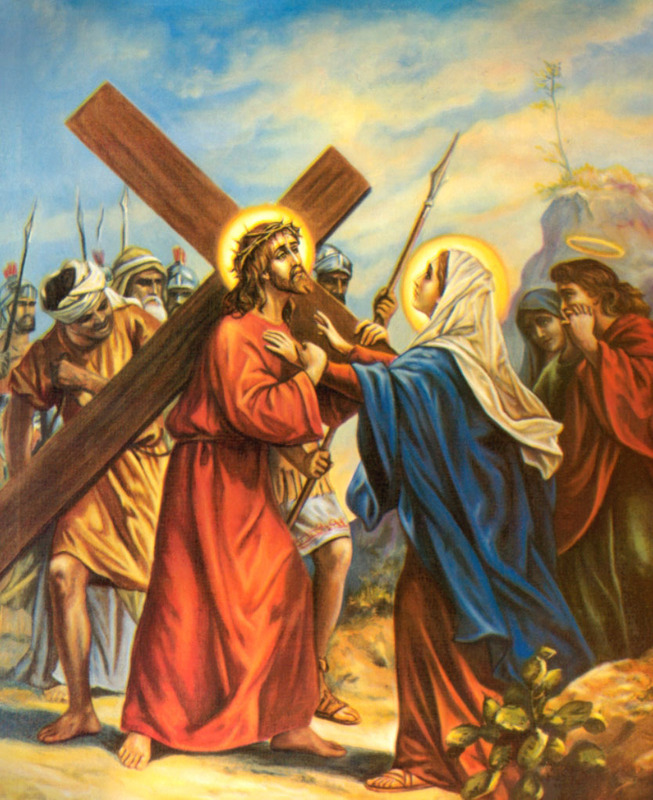 As a mother, she suffered the pain of watching her son carrying the heavy wooden cross on his shoulders. She saw him stripped, beaten, whipped and wearing a crown of thorns. 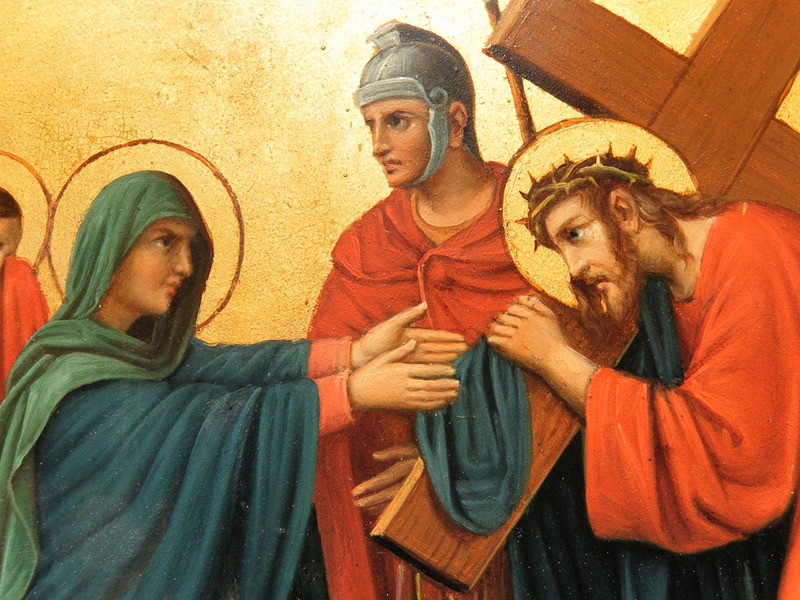 She shuddered when the Roman soldiers pounded the nails into his hands—the same hands she caressed when Jesus was a babe—and she must have closed her eyes and turned away when the lance pierced his side. Comforted by John, she stood idle as the soldiers taunted her son and then executed him. And then she held Jesus in her arms when they took his body down from the cross. The mother of the Word Made Flesh endured the horror of this ordeal, and as the Blessed Virgin Mary, she did not allow hatred of the soldiers and the crowd to enter her heart. Yet as a woman, she could not hide the pain that gripped her face. Just like the rain that falls when the clouds fill with moisture, the hurt had to come out; and it was released in the tears that ran down her face—like the raindrops streaking the window beside my pew on this dark autumn afternoon. Despite being a season of sacrifice, Lent is my favorite time of the year. 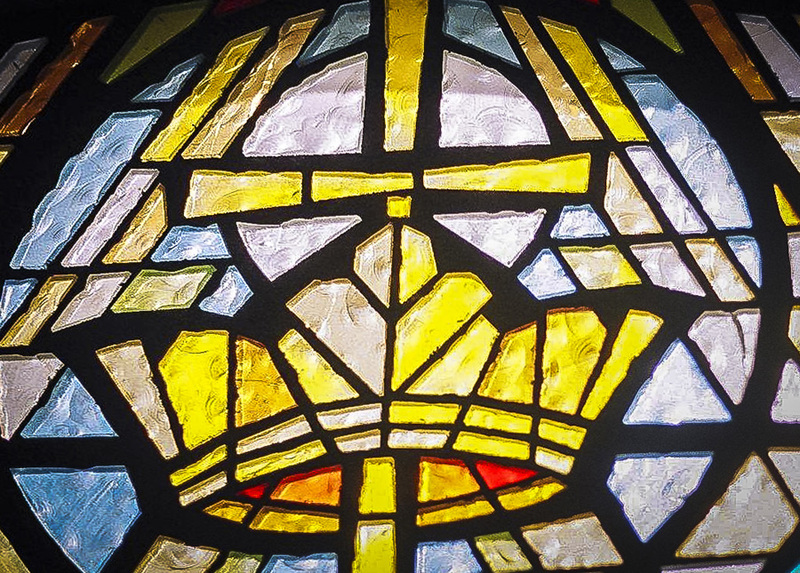 For Christians, Lent marks a period of reflection, a time to pull inward, block out distractions, sweep away mental clutter and draw closer to the Lord in communion with the Spirit. It’s a spiritual status check and offers us a chance to recalibrate in pursuit of goodness and light. Stained Glass Window. Photo by Francis DiClemente. Since relocating from Arizona to my native central New York in 2006, I have enjoyed celebrating Easter more than Christmas; this preference is based partly on meteorological reasons. Christmas leads to a descent into the clutches of winter; I think of Persephone returning to Hades and the Earth becoming barren. Here in Syracuse the clouds drop lake-effect snow continuously and ice coats streets and sidewalks as the cold gray days stretch for months. And it seems my body doesn’t fully thaw out until about mid-April. Let’s not even talk about the winter air causing dry itchy skin and my black knit hat producing static electricity and an Alfalfa-inspired hairstyle. For those who don’t ski, snowboard or play ice hockey, winter is nothing but a drag. But with Lent there is hope in the form of spring renewal: we march through a series of events that herald a change of season—Daylight Saving Time, Major League Baseball spring training, St. Patrick’s Day, the NCAA basketball tournament, opening day of the baseball season and the start of the NHL playoffs. I realize the heavy sports theme, but your mind needs something to look forward to when you look out your window and see nothing but a wall of white. Lent also brings the added benefit of Friday fish fries. I never quite understood the logic of Catholics giving up meat on Fridays only to eat a huge greasy piece of cod or haddock and a plate of French fries. But why complain? Moderation is everything, so pass the crispy potatoes and fish. With the onset of Lent and the celebration of Easter, I know Mother Nature will alter the landscape in central New York. It may take a while, but the flowers will bloom, the trees will bud, the sun will shine again and the temperature will climb above 25 degrees. 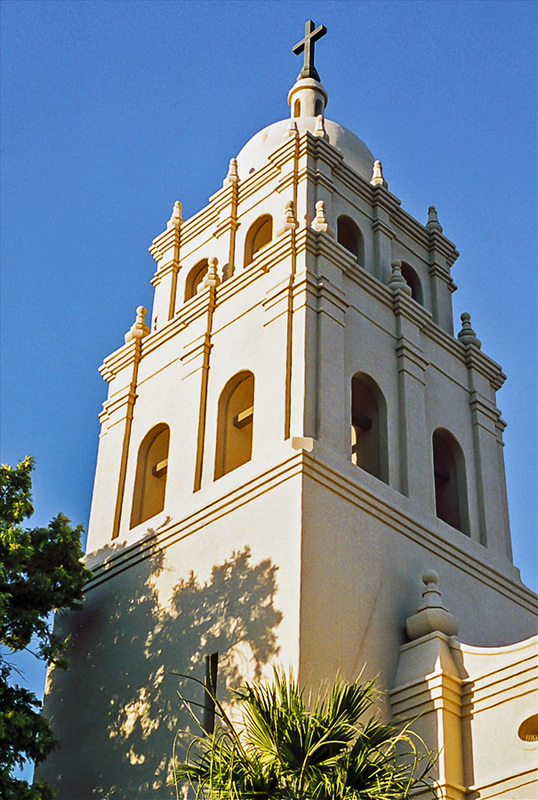 St. Francis Xavier Church (Phoenix, AZ). Photo by Francis DiClemente. Yet a spiritual renewal is even more important. Lent shifts the focus to the priorities of life: family and faith. I am reminded once again that this world and my place in it are passing away. Time ebbs and I need to strengthen my relationship with God, devoting time to it instead of making it ancillary, like squeezing in a few prayers before bed. I also strive to become more patient, more giving and less selfish. I don’t always succeed but that’s part of the growing process. But here’s the real reason Easter beats Christmas in my opinion. Christmas is the beginning—the Incarnation, the Word Made Flesh. Easter culminates Christ’s mission on Earth. For believers, Christ’s death and Resurrection guarantee our salvation. Take away the Passion and we have no redemption. So that’s why Easter has always seemed the more solemn holiday for me. And in reviewing the Stations of the Cross, I recall the sacrifice Christ made for us. And as that knowledge sinks in, it gives me a sense of security in an insecure world. 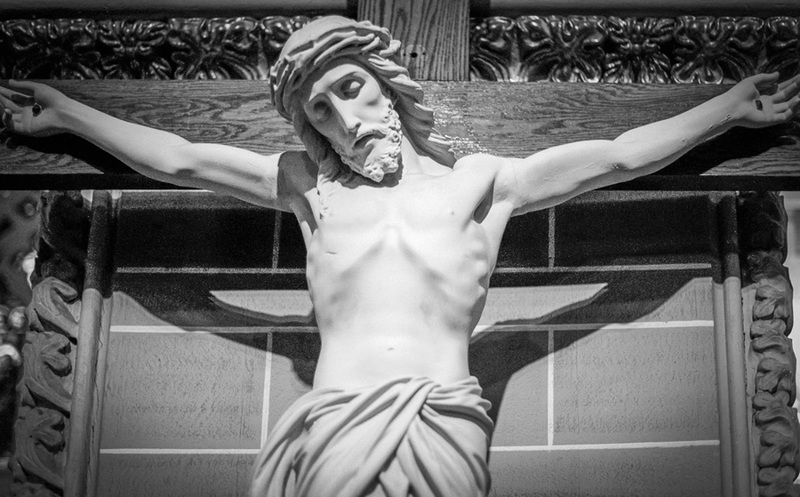 Christ on Cross (St. Peter’s Church, Rome, NY). Photo by Francis DiClemente. During Lent I also try to read the Bible more often. So I’ll leave you with a passage I ran across recently. It’s from the Apostle Paul, and although I am not one to quote Scripture, I feel this text can penetrate the darkness, bringing hope and shining light for anyone, even nonbelievers. “We are hard pressed on every side, yet not crushed; we are perplexed, but not in despair; persecuted, but not forsaken; struck down, but not destroyed … therefore we do not lose heart. Even though the outward man is perishing, yet the inward man is being renewed day by day. For our light affliction, which is but for a moment, is working for us a far more exceeding and eternal weight of glory.” (2 Corinthians 4:8-9, 16-17; King James Bible).